NETWORK FINALS: Note that SUPER SCHOOL LIVE, which aired on all the networks except CW in the 8PM hour, wasn’t rated by Nielsen in nationals because it aired without commercials. Elsewhere, 20/20 and the reruns of AMERICA’S GOT TALENT, BEAT SHAZAM and BLUE BLOODS lost 0.1 in final numbers. CABLE HIGHLIGHTS: Hurricane Irma had total control of Friday cable, as every one of the Top 13 slots went to a Weather Channel segment, with the 11PM hour on top at 0.73. CNN followed with the next 3 slots (topped by the 8PM ANDERSON COOPER 360 at 0.48). In fact, the only non-Weather Channel, non-CNN telecast in the Top 20 was HBO’s REAL TIME WITH BILL MAHER, back from a break at 0.43 (ROOM 104 jumped 0.06 to 0.12). Nickelodeon’s PAW PATROL was at 0.40. 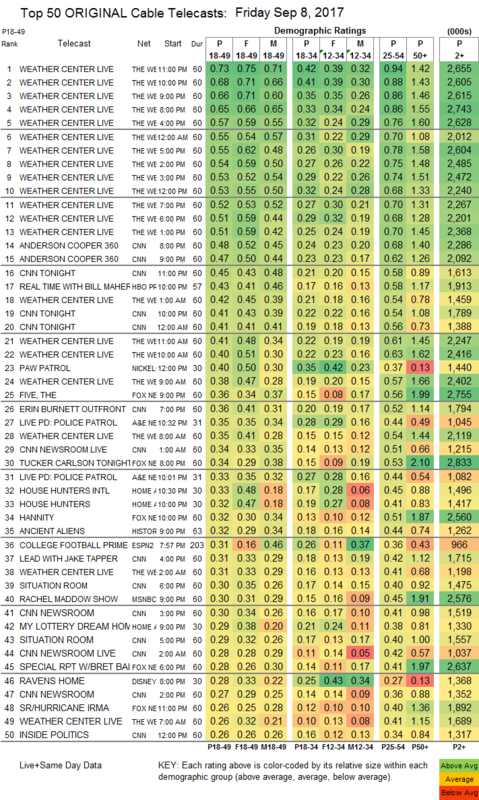 On A&E, 2 segments of LIVE PD were at 0.35/0.33, compared to last week’s 0.34/0.31. On HGTV, HOUSE HUNTERS INTL rose 0.06 to 0.33, HOUSE HUNTERS was up 0.03 to 0.32, and MY LOTTERY DREAM HOUSE was at 0.29. History’s ANCIENT ALIENS was at 0.32. Discovery’s BERING SEA GOLD gained 0.06 to 0.26. Food Network’s GUY’S FAMILY ROAD TRIP dropped 0.04 to 0.26. MTV’s RIDICULOUSNESS was at 0.24/0.20/0.18, compared to last week’s 0.32/0.28/0.24, all of those preceded by UNPLUGGED at 0.09. On ID, DEADLY WOMEN fell 0.05 to 0.20, and DEADLY SINS was down 0.09 to 0.18. 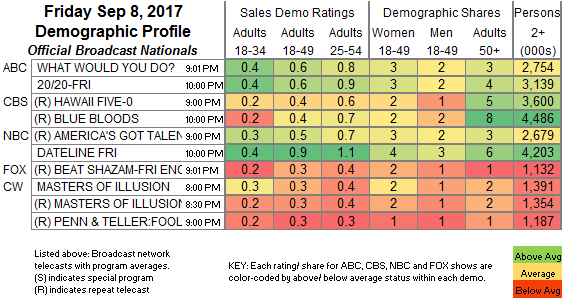 We’s MILLION DOLLAR MATCHMAKER dropped 0.04 to 0.08.